Growth in the plant and animal kingdoms is mostly measured in size; in the human realm it has to do with emotional and intellectual maturity - playing a responsible part in the community and fulfilling one's role properly. Whatever we seed must be attended to so that it develops into full expression, and this applies to our projects an well as our children. Generally, when left to its own devices, life finds a way to protect us all. In this example the hen’s instinct is to provide for her offspring until they are old enough to cope. 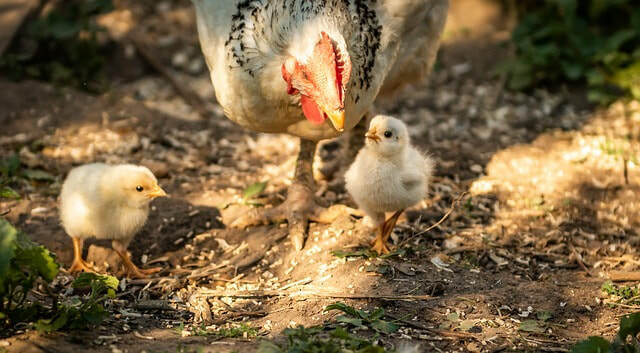 Mothers are hard-wired to make sure their genes survive and prosper, thus the hen’s nature protects the chicks. There is, however, a general requirement that we exert ourselves in some way in order to have our own needs met. All life is kept going through exchange, and ‘food for work’ is the commonest formula. Normally the reward for industriousness is sustenance – and often material abundance. Peace of mind also follows, as long as the work we are doing is an authentic expression of who we are. Then it feels good to be doing it and finding higher achievement through it. Typically a deeply gratifying feeling is experienced when we have overcome challenges to become who we truly are. In fact, we can say that self-fulfilment mostly depends on both finding the right life path, and pursuing it with real application and a significant degree of commitment – even doggedness. In contrast, those who spend their life busy doing nothing are prohibited from feeling the sense of well-being that is so sought-after. Therefore, we need to learn discernment – between what is meaningful and self-consistent, and what is mere bustle. We find ourselves well equipped to turn every occurrence to our advantage, we then become able consistently to provide ourselves and others with what is needed.